You know it’s time to do something about that tooth of yours. Maybe it’s damaged and on the verge of breaking, or maybe it’s already cracked. Either way, you want to get it fixed so nothing worse happens to it, and to keep your natural tooth intact. Crowns cover the entire visible surface of a tooth, and can be used for a cracked, chipped, weak, broken, or worn down tooth. It can also help support a dental bridge or denture, or even cover misshapen, uneven or discolored teeth. There are several types of crowns. Each one has its own unique benefits. You can choose from ceramic, stainless steel, resin, metal, porcelain, and porcelain-fused-to-metal. We normally use porcelain crowns in our office for a variety of reasons. The main benefit is that they match the color of your teeth so they are virtually undetectable. We will perfectly color match your crown to fit in with your other teeth so no one will know it’s there. Porcelain crowns are durable, natural-looking and don’t cause harm to anyone with a metal allergy. Then, there’s the single-visit CEREC crown. 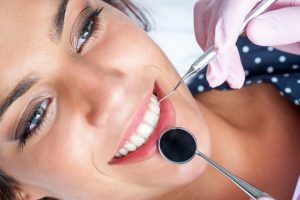 The good news about this one is that you can get the procedure done quicker than most crowns, which typically take two to three appointments to complete. By using advanced technology, your dentist will be able to create and attach your crown in a single appointment instead of waiting for the dental lab to create your crown based on the initial impression. This is a great option for patients looking for a quicker, more convenient solution. At your first visit when considering a crown, your dentist will want to take a close look at your tooth and the area surrounding it. This should help him or her determine whether or not you’ll first need to get a root canal treatment, filling, or anything other treatment. You want to make sure that the tooth underneath the crown is healthy before the crown is attached. Once a decision has been reached, your dentist will begin the process. First, he’ll numb the tooth and the surrounding gum. Then, the tooth will be sized down, so that it’s able to properly fit the crown. After this, your dentist will take an impression of your teeth and send it to the dental lab so they can create a perfectly-fitted, natural-looking crown. This will take two to three weeks, in which you will wear a temporary crown. On your next visit, he’ll numb the area once more. At this time, the cap will be cemented onto your tooth. You shouldn’t feel any pain during this procedure. Crowns make it possible to conceal certainly noticeable imperfections in your teeth so you can achieve a flawless smile. This is sure to do wonders for your overall confidence and help you enjoy your smile. If you have cracked or chipped teeth and don’t receive a cap, you could end up with some serious issues. For example, a cracked tooth could continue to crack or even fall out. This could affect the overall appearance and health of your smile. Crowns help you maintain your dental health and ensure you keep your natural teeth intact. If you’re not pleased with your smile or if you have a tooth that’s bothering you, it’s time to take action. Schedule an appointment with us today for your smile consultation!